When it comes to detecting the quality of an Persian or Oriental rug, there are a number of factors involved, which includes a carpet’s knot count. Why is the knot count important? Because it not only shows the amount of work involved in creating the piece itself, but it also plays a tremendous role in the quality of the rug’s motif, also known as the decorative design or pattern. The most common measurement for Oriental and Persian rugs is the knots per inch, which is often referred to as the KPI of a carpet. It is equivalent to the pixels (dots) that make up a computer or TV screen, where more pixels create a more precise image. And just as with expensive televisions that feature extremely crisp and clear pictures, the more defined a carpet’s motif is, the more likely it is a high-quality – and valuable – rug. Measurements for a rug’s knots per inch is usually done by counting the number of knots per square inch on the back of the rug, where they can be seen more clearly. The large majority of Oriental and Persian rug dealers will have a special measuring tool on-hand to that makes the job easier, which is essentially a square ruler with a 1-inch window whose markings aid in the process. Counting the knots begins with measuring the number of knots in 1 square inch both vertically and horizontally, then multiplying these two numbers together to get the final KPI. However, the knots in some rugs can be somewhat deceptive, appearing to have twice as many knots as they actually contain, which is why this is sometimes better left to the Oriental rug experts who know what to look for. During the production of a carpet, an overwhelming number of weavers will employ the use of either the Turkish (Ghiordes) knot or the Persian (Senneh) knot. The Persian knot is an asymmetrical knot, while the Turkish knot is symmetrical. You can see the difference between the two below. 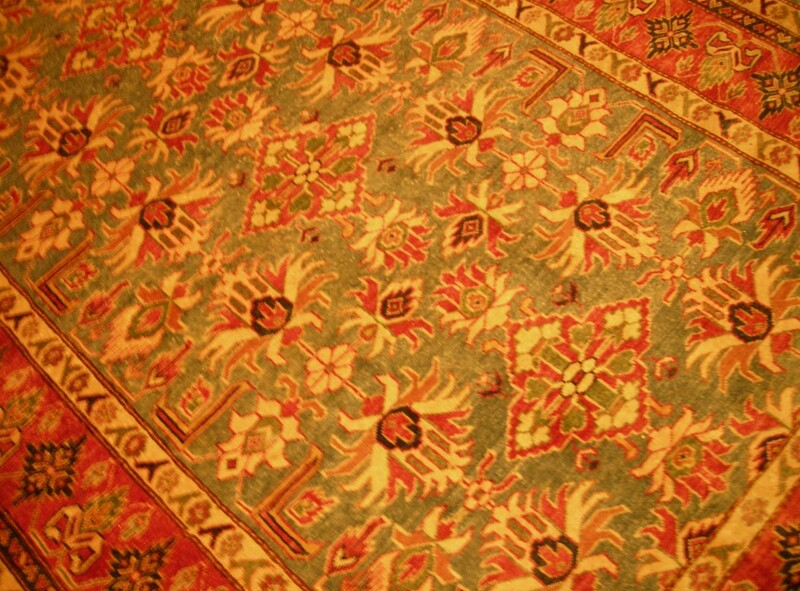 You will typically find Turkish knots in rugs woven in Turkey and the Caucuses. Persian knots, on the other hand, are found in countries such as India, Pakistan, China and other Eastern European and Asian countries. Surprisingly, in Iran you can find carpets built out of both types of knots, though you will likely never find a rug that has employed both types in the same piece. Another type of knot, and one you should probably avoid when searching for an Oriental rug, is the Jufti knot. This knot is created by threading through four warp threads instead of two, as is done in the knots above. A Jufti knot is a sign of someone who hurriedly put the rug together, sacrificing both knot density and quality when manufacturing the carpet. Rugs made with the Jufti knot tend to be less durable and often appear shaggy and coarse. Many of the most beautiful rugs – and even textiles – in the world contain the highest number of knots per inch. Nevertheless, there are a wide number of carpets which are extremely valuable and sought after that don’t exhibit an extraordinarily high KPI. Really, it comes down to what about a carpet, including its country of origin and design, delights you as an enthusiast or collector, and how well it complements your décor.